Look! It’s An Etsy Contest! Erin and Melissa are two creatively crafty moms who, in an effort to create items for their children to wear and use, have stumbled upon some great ideas. Between sweet knit toques and highly functional stroller liners, LittleEvaCharlotte was born. Their designs are unique, customizable and entirely practical. This is your chance to win any one item from LittleEvaCharlotte, just in time for the Christmas season. The winner will get to pick whichever item from the Etsy store they like most – and there are four easy ways to win. You can even enter in all four ways, ensuring four entries in the contest. 1. Visit LittleEvaCharlotte‘s Etsy store, come back to this site and leave a comment naming your favourite item in the online store. 2. Follow LittleEvaCharlotte on Twitter and Tweet about this contest including the hashtag #LECcontest. 3. Join the LittleEvaCharlotte group on Facebook and leave a comment on the group’s wall, linking back to this site. 4. Simple: write a quick blog post about LittleEvaCharlotte, naming your favourite item with a link back to the Etsy store. You have until the end of this week to enter in one or all four ways. A random draw will take place next Saturday, December 12. Good luck! I love the Pinky Snuggles hat! Little boy blue is classic and awesome! Some cool stuff on there. Great store, some lovely stuff. My son would look cool in the Long Tail Hat! flour sack hat is a for sure favourite. the blue accordian hat, love it got a little boy, so blue it is! I love this item! I think it’s baby ‘chic’. Would look super cute with a Baby Gap romper I got, and a pair of chestnut Uggs. 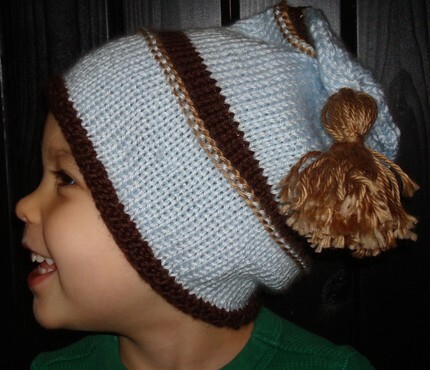 “Flowered Miss” – Since I am having a little boy, this would look SO cute on him!